A functioning air conditioning Indio unit is crucial for getting through Indio’s searing summer heat. And no other homes around California benefit more from a working air conditioning than those in the Coachella Valley. In the middle of the summer, highs can soar up to 120 degrees from July to September. Each day, homeowners have no choice but to crank the central air conditioning on full blast to keep cool, even if it means three months of high energy bills. And it’s no surprise then that homeowners in the Coachella Valley go through great lengths to spread cool air and lower the temperature throughout their home, even in the garage to keep cars cool. Instead of sacrificing your utility bill costs for day-to-day comfort, we recommend a strategy for keeping as cool as possible while saving as much energy and money over the summer. Besides, a summer spent in the beautiful Coachella Valley is worth the energy spent on an air-conditioned home. If your air conditioning unit is twelve years or older, chances are you need to replace it for the most energy efficiency and savings. Make sure your system is Energy Star rated, have high Seasonal Energy Efficiency Ratio (SEER) and EER ratings. The higher the ratings, the more efficiently these units will work in certain heat. Central air conditioning units, also called “split systems,” condense, compress, and blow air into your home from the outside in. When you install an outdoor unit, you’ll need to replace your entire heating system for maximum efficiency. This goes without saying: keep the cold air in, and leave the hot air out. Making sure your windows and doors stay closed while your air conditioner blows cool air through your home is a no-brainer. However, opening and closing doors is unavoidable from day to day. That’s why it’s important to go through your house and make sure your windows are sealed, caulked, and closed completely. The same can be said for doorways. Make sure your doors have no cracks or spaces that are secretly letting the cool air out and the hot air in. When temperatures outside are higher than temperatures indoors, household chores can be extra burdensome on your energy bill. Doing laundry, using the stovetop or oven, and the doing dishes in a dishwasher all increase the temperature indoors, which in part causes the thermostat to work extra hard at regulating the indoor climate. Instead of getting these chores completed during the heat of the day, save them for the evening, when temperatures drop. Other appliances, like lights, TVs, radios, and other electronics generate heat during the day. For the most savings, it’s best to switch these appliances off until later in the day, when the sun has gone down and valley cools. Sometimes all it takes to cool off after a hot day is an ice-cold shower. Instantly you’ll feel much cooler, revived, and at no cost to your energy bill. There are multiple health benefits associated with showering in cold water, like weight loss, muscle recovery, and even stress relief. Plus, cold showers are better for the environment, since it requires no energy to heat water and leaves you feeling fresh. We know what happens when you place a magnifying glass in the sun. The same effect of solar heat gain happens when you keep your curtains, blinds, or drapes open and your window exposed to the sunlight. While the desert sun might illuminate your home in an appealing way, your air conditioning unit has to work harder to keep your home cool against the power of the sun’s heat and energy. That’s why during the day, it’s extremely important to keep your blinds and curtains closed. We also recommend getting highly reflective blinds for your home, especially those with lighter colors. A ceiling or rotating fan can feel like a summer breeze in your living room. Having a fan running can not only make the room feel several degrees cooler against your skin. Coupled with a properly functioning air conditioning unit, fans also let you raise the thermostat slightly for more a more efficient output. There’s no need, however, to run a fan during the day when you aren’t home. A fan doesn’t lower the temperature of the room, but it feels sensational when it cools you down on a hot day. Everyone has their favorite thermostat number. For the summer, the usual comfort level for thermostats is often between low 70’s and high 60’s. A difference in a few degrees over time can alter the cost of your energy bill and footprint. Try to keep your thermostat at a higher level when your away from your home, or when you’re asleep. In fact, lowering (yes, lowering) your thermostat to 78 degrees could reduce your bill by as much as 10%. Also, while keeping your thermostat at 71 might be your most comfortable level, making a minor adjustment to your temperature could save you a bundle. Ask yourself what the highest temperature is that you can enjoy from day to day? Though a slightly higher thermostat temperature may feel uncomfortable at first, the combination of a ceiling fan can balance out the feeling as well as your utility budget. 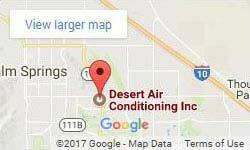 About Desert Air Conditioning Inc. Since 1954, our multi-generational and locally owned business has served Palm Springs, Indio, and the surrounding towns in the Coachella Valley. Our reputation surpasses us, as our high customer review ratings and A+ rating from the BBB speak for the quality of our service. As longtime residents, we know how difficult a summer in the Sonora’s Colorado Desert can be without a working A/C Unit. That’s why we’ve made it our duty to make sure air conditioning, HVAC units, and thermostats are working in homes from the San Jacinto Mountains to the rolling hills of Joshua Tree.